A stage (面, Men) is a level in gameplay that contains obstacles, stage enemies, items, and the like. The player must pass a stage by defeating the boss at the end of each stage in order to proceed to the next stage or complete the game. Unlike other video games however, being a shoot 'em up based on the Touhou Project , the Len'en Project contains the gameplay of danmaku, dodging bullets as the obstacles. The stages each have a unique theme and may also contain a midboss within the stage. The player does not have the ability to freely travel around a stage to see its scenery, being a shoot 'em up. Instead, they wait for stage enemies and bosses to approach and shoot bullets at the player for them to dodge. 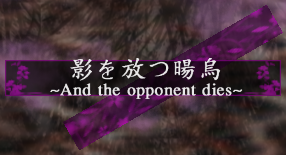 Usually, when a player defeats a boss of a stage, the text "STAGE CLEAR" will appear. The background of the stages are in 3D and thus plays through a path of some sort as the stage proceeds. Also, each stage is located at a location of some sort, and they're also given an actual title. Usually, each Len'en game as a total of 6 stages with an Extra Stage. On a game's title screen, There is a "Practice Start" that allows the player to select a certain stage if they've completed such stage on the main scenario. There is also an "Extra Start" that's based on the Touhou Project's that has an optional Extra Stage to challenge the player if certain conditions are met in the main scenario. This page was last edited on 24 September 2018, at 09:04.